Rubi Ibarra just celebrated a birthday she will never forget. She turned 15 years old. So, her family planned a traditional quinceanera for her. A quinceanera is an important coming-of-age party for girls turning 15. A few weeks before the party, a photographer placed a video to the page. The video showed Rubi's father describing what his daughter's party would be like. Crescendio Ibarra said there would be local musicians, food, prizes and horse races. He said "everyone is cordially invited." By everyone, the Ibarra family later explained, he simply meant everyone in nearby towns. But the public invitation quickly went viral. As a result, "everyone" who saw it thought they were invited. More than 1 million people said on Facebook that they planned to attend the quincea?era. Even a Mexican airline company offered low prices on flights to a city near Rubi's hometown. Its advertisements for the offer said, "Are you going to Rubi's party?" Photographers and reporters from around the world were present. The Associated Press described the Mexican teenager as looking a bit "overwhelmed" by the attention, but "resplendent" in her dress. Jose Antonio Sosa is an expert on social media at the Iberoamericana University. He said that Mexico's great interest in Rubi's party showed a desire for lighter, happier stories in the news. Municipal governments host special Coming-of-Age ceremonies for20-year-olds. He spends all his money betting on horse races. Deeply touched, Kennedy shared the story with others and it went viral. 1.As a result, "everyone" who saw it thought they were invited. As a result of this conflict he lost both his home and his means of livelihood. 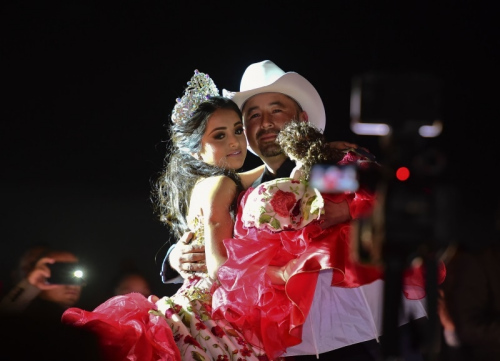 2.And, while 1 million people did not actually attend, Univision reported that more than 30,000 people showed up to help Rubi celebrate her 15th birthday. She just showed up and then left.